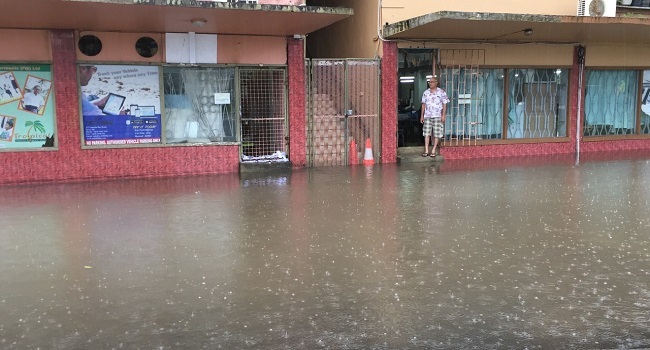 The heavy rain in the Central division this morning has caused most areas in Suva to be flooded due to blocked drains. Areas in Vatuwaqa, Nadera, Narere, Laucala Beach, Sekoula Road, Laucala Bay and Varani Street were some of the areas affected. Director of Tropical Garments in Laucala Bay, Bhupendra Kumar told FBC News he had to release his staff to go home as the factory was flooded since 6am. The water, which was nearly two feet was due to a blocked drain that has affected their productivity today. Kumar says this has been an ongoing issue since 2006 but the authorities hasn’t done anything about it despite numerous calls and complaints about the blocked drain. FBC News also saw that most children were playing in flooded drains and playing on the roads despite the heavy rain and warnings from authorities. Water has receded in some areas while others are currently being cleared by Fulton Hogan engineers. A trough of low pressure with associated cloud and rain lies slow moving over Fiji. It’s expected to affect the group till later Thursday.